I’ve talked a little bit before about my motivation for writing a story like Darkeye was on my tumblr, but I figure now would be a good time to do a general round-up of a lot of the interesting real-life inspiration for this sad dog story. And mind you, not all of it is from before the story started. Before I began writing I had really only sketched out ideas for the story up to chapter 31 (it was also supposed to end around then, too, to my continuing dismay). A lot of the real stuff I can draw parallels to in Darkeye is actually the result of slightly creepy coincidences that I wasn’t aware of at the time of writing. That said, let’s delve into a round-up of some of the real science and speculation that relates to this very odd sci-fi story. Spoilers for up to chapter 77 ahead! I’ve been asked: if I wanted to do a story like this, focusing on the relationship between animals and man, specifically dogs, why not stick to domestic dogs? Or even just domestic dogs and wolves, for contrast? To be honest, the story would probably be much tighter if I did leave it that way, but I didn’t want to write a story about dogs and wolves. I didn’t want to write a story about the relationship between animals and humans at all in the first place. I wanted to write a story about mammalian carnivores- and this was later restricted to just canids. What would the story be about? I didn’t know yet. All I knew was that I was researching different canid species that I’d never heard about, and they were really cool. Bear in mind that this was circa 2003. More than ten years ago. I was in freakin’ middle school. While I was writing a lot of things of varying qualities back then, I put that idea aside for quite a few years until 2012, where it resurfaced in what was supposed to be my field notebook for bat surveys. At this point I determined that I was going to write a story about multiple species of canines living together. But why were they together? There had to be a plausible reason for them to be so bonded, and I really wanted it to be feasible in terms of natural behavior (never mind that they were going to be talking in the story). I eventually hit on the idea that they had been raised together- but by whom? Another dog, obviously, but a special kind of dog, one that would have unusual ideas. A domestic dog- a dog that, by nature, was used to being taken from its family. But not just any domestic dog, this was sort of a ‘traitor’ dog, one that had left humans behind. A pariah dog. Ironically I had originally planned for humans to be completely or almost completely absent from the story, which is why I placed it into a sort of post-apocalyptic setting. Originally, the dogs lived in a much more naturalistic environment, and happened upon an abandoned camper- that was their only hint of humanity. The lack of humans, which I had originally set up as a means of getting them out of the way, really began to nag at me, though. Exactly why were they gone? Where had they gone? Discovering-what-really-happened tropes in post-apocalyptic settings are some of my favorites, and so once this idea got to me, I really latched on to it. My first inkling was that the humans had become overpopulated and starved. Well, if they starved, then why were the main characters doing hunting deer? Because that’s a food that humans can eat, isn’t it? So the deer and the naturalistic setting got cut out because again- starvation! The other details of the premise fell gradually into place once I had nailed down this setting. The dogs could talk in the first place because of human meddling- but obviously the humans would have intended it for domestic dogs first; the wild ones were an accident. They had some sort of social organization amongst them, and it was obvious that the pariah dog’s methods of pack formation were unorthodox. Initially I had her down as some sort of rebel leader of a massive mixed pack, with our main trio as a clique within it, but I scrapped that idea quickly. Pariah was more complex and subtle than that. Humans were still not going to be a big factor until I got an odd image in my head, of a dhole seeing human children, and teetering between her conflicting desires to eat or nurture them. That was so interesting that the children became a much larger part of the story, with the dogs taking care of them, and hiding them from other dogs that wanted to eat them. And of course that tied in with our main characters’ unusual upbringing- they were used to having adoptive brothers and sisters. 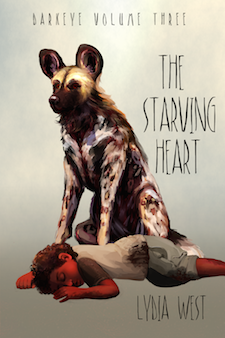 With the inclusion of some living humans, however, that circled back around to one of the original plot holes: if the humans had starved and died out, what was left for the dogs to eat? Finally nswering this question finally led me to some of the darkest and most sinister aspects of the story, which was originally intended to be a lot cheerier. But I suppose that’s just how things go. I decided on the species for the initial main trio of Mhumhi, Kutta, and Sacha in my usual ham-fisted fashion. Basically, I picked my three favorite species of canids, intentionally avoiding wolves (in my opinion, wolves get more than their fair share of attention). African wild dogs like Mhumhi had always captured my heart, especially when I caught occasional glimpses of them in programs like Big Cat Diary and Planet Earth. That one was easy. And dholes were almost an Asian variant of the same, considering the similarities in their behavior and pack structure. 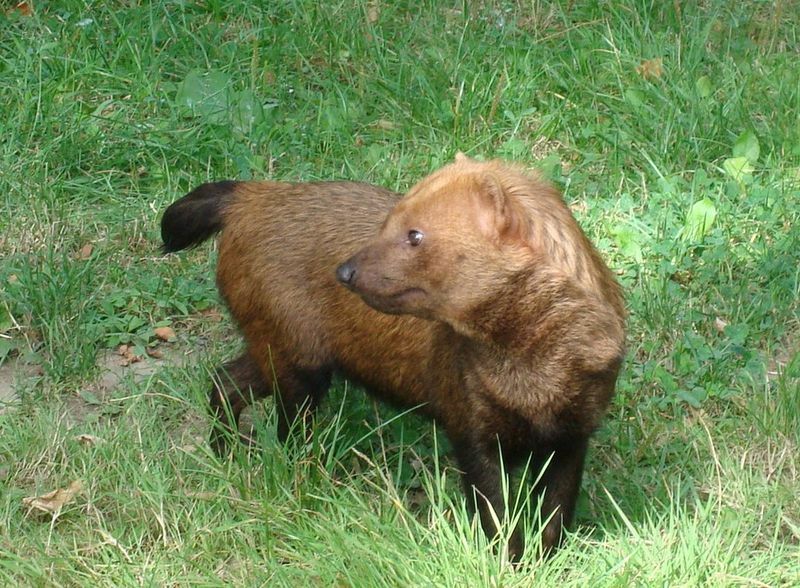 Bush dogs rounded them out, as another highly social, but much smaller, species. I didn’t know it then, but the three species that I had more or less randomly picked were actually linked in a number of ways. First and foremost is their dentition: while all other canid species have 42 teeth, these three have 40, along with specialized carnassial teeth with shearing blades called trenchant heels. This is an adaptation for a lifestyle centered around meat and meat only; unlike other canid species, these three don’t dabble in fruit or veggies from time to time. Due to the presence of this specialized dentition, the three species were once grouped together in the same clade; however genetic evidence has since placed the bush dog away with its closest relative the maned wolf among the other South American canids. Teeth and obligate carnivory aren’t the only things grouping these species. Aside from the wolf, they are also the only pack hunters amongst canidae. And boy, the dholes and African wild dogs take it to the extreme, living in enormous groups of sometimes thirty or more individuals with the capacity to take down multiple kills in a single day. The bush dogs are no pushovers either- there is at least one report of a pack of them attacking a tapir. This is more impressive when you realize that tapirs can weigh 500 pounds to the bush dog’s 18. Unfortunately not nearly enough is known about bush dog behavior or bush dogs in general- there isn’t even adequate information to classify them as threatened or not. Let us consider for a moment that abomination—that blot upon the many interesting wild things—the murderous Wild Dog. It will be an excellent day for African game and its preservation when means can be devised for its complete extermination. Unfortunately, Maugham nearly got his wish. The African wild dog population was reduced from about 500,000 to the only 5,000 or so that remain in the wild today. 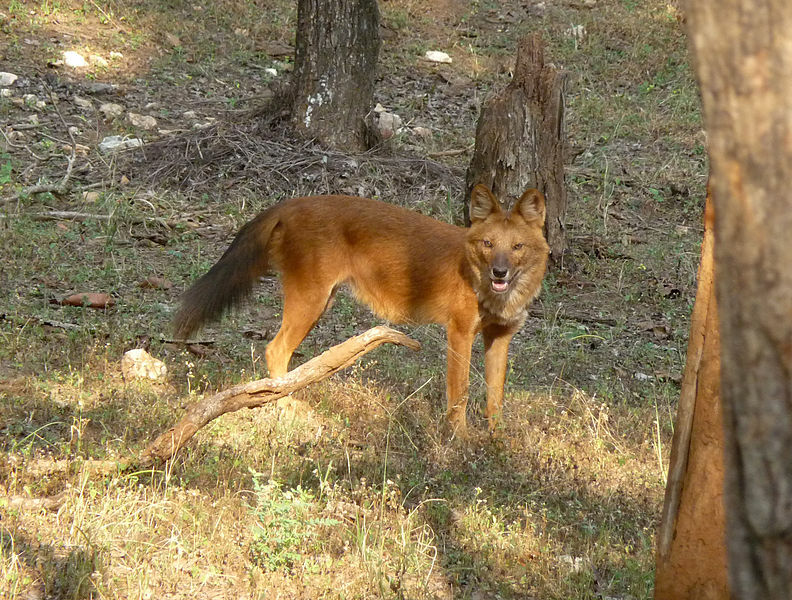 Dholes are in an even greater predicament with only about 2,500 remaining in the wild. Hunting was the driving force behind the extreme declines in both populations, but even with their current protection both species face numerous difficulties in regaining their numbers. First and foremost is the fact that they live over very large territories in large, well-established social groups. They are obligate social carnivores, meaning that groups smaller than five or so are more or less doomed to be unable to catch enough food for their huge litters. This presents a real challenge for people attempting to reintroduce captive populations to the wild: they have to be in close-knit family groups to start with if they are to succeed. 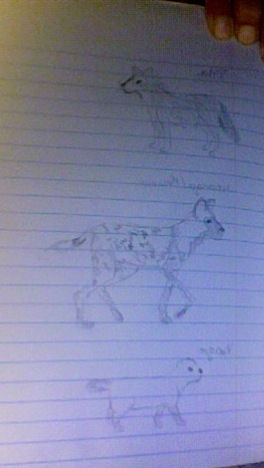 I won’t deny that the plight of these species was another motivation for me to feature them as main characters, even though some African wild dogs also function as something like antagonists during the story. By the way, the unusual structure of the Madame’s pack referred to in chapter 40 is based off of a real-life phenomenon within African wild dog packs. In particularly large packs more than one female may give birth, and if the dominant female does not choose to kill the subordinate’s pups, she will often integrate them into her own litter. I plan to discuss the fascinating social tendancies of these canids in more detail in later posts, so stay tuned. Many people have guessed (correctly) that Darkeye takes place in Africa, specifically Northeastern Africa, alongside the red sea. I didn’t want to centralize it to a specific country, however. The weird Westernized everycity that the story takes place in isn’t based on any real city either, though it takes in structural elements from the largest cities around the world. The gigantic solar-powered ‘trees’ that Mhumhi spots from the trolley, for example, are based on the supertrees of Singapore, along with its botanical gardens being similar to the Great Glass Garden where Madame lives with her pack. The area where the pack of wolves lives is based off of Times Square in New York, while some of the giant skyscrapers were inspired from the Dubai skyline. I used maps of Tehran to help plot the city structure, from the outlying suburbs to Oldtown to the inner business districts. Other areas within Darkeye are based on real places. The sand houses that Mhumhi and company visit in chapter 54 are based on the real-life city of Kolmanskop, an abandoned mining town in Namibia that has slowly been taken over by the Namib desert. The entrance to the safe place in chapter 58 is supposed to resemble both a mosque and a church. The bouda (or buda) is an Ethiopian monster that transforms from a man into a hyena at midnight, and back again at dawn. It unearths and eats corpses and has the power of the evil eye. Similar werehyena-type folklore is found in many other countries in eastern Africa. The bouda in Darkeye are not, of course, magical monsters, but genetic experiments. However, they were called bouda by others for obvious reasons, even though they merely picked hyenas to use as their genetic repository because they were larger than any dog and highly intelligent. The reason that the bouda even show up in Darkeye is due to the fact that I ended up fusing two different concepts: I had wanted to write a story about werehyenas just in general- and I may still do that- and I also needed a third group within Darkeye. I had humans, and I had “intelligent animals,” now I needed “animal animals.” Unlike the dogs, which have human-level intelligence, the bouda maintain separate animal and human minds- or at least they delude themselves into thinking that this is so. You can also think of the bouda as a sort of unintended punishment, deserved or not, for trying to escape the overpopulation cull and continue breeding. They can now only breed as animals. The effects of domestication are one of the big focuses within Darkeye, in no small part because I find them really interesting. And, after all, the domestic dog is the oldest domestic animal in the world, with the most recent estimates placing the initial domestication as far back as 32,000 years ago. We can see the precursors to domestication in many wild canid species today as they move into urban environments. Did you know that there are about 33,000 red foxes living in the cities and suburbs of the U.K.? Or how about the fact that there are nearly 2,000 coyotes living in Chicago, and that they live longer lives than their rural counterparts? Even grey wolves are moving closer to urban areas, in countries like Italy. What drives these normally shy animals to come close to areas full of noisy humans is, of course, the increased availability of food and the lack of other predators. And, at least in the case of coyotes, it can really pay off: young coyotes are twice as likely to survive to adulthood if they’re born in a city. Coyotes that grow increasingly less shy may face better chances of survival as they can get closer and closer to human garbage and other sources of food. Of course, there is a trade-off, as the less-shy coyotes risk running afoul of irate humans with guns. But this is, in short, the current most prevailing theory behind how dogs were domesticated. Ancient human hunters left behind large piles of meat scraps from their kills, and the less-shy wolves that approached them were the ancestors of the first dogs. These early dogs performed other services that made humans want to keep them around: they barked at the approach of strangers and predators, they could be used as pack animals, and they helped track and then later herd prey animals. We don’t require these services in modern cities, so it’s unlikely our relationship with the current wild urban canids will go much deeper than the current mutual mistrust. However, these are some scientists who take the dog domestication theory perhaps farther than many people are comfortable with. Not only were dogs helpful, but they may have been helpful enough to, say, allow Homo sapiens to outcompete their larger cousins, the Neanderthals. With their ability to herd animals, dogs were crucial in allowing the first domesticated livestock to develop, enabling human civilizations to retire from being hunters and settle down. There’s even another theory that the domestication of dogs directly influenced the evolution of the human eye. 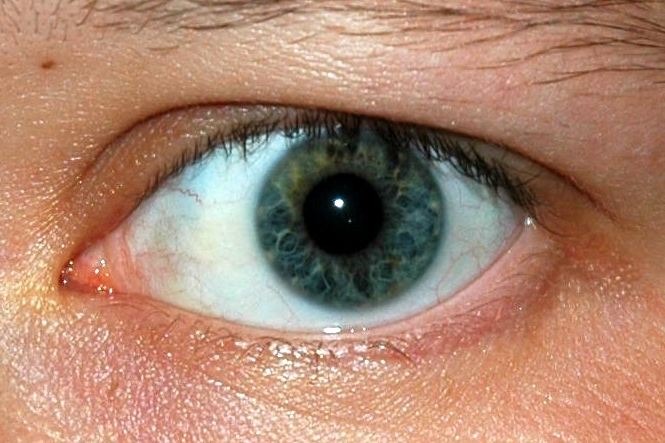 Humans have white sclerae- that white area of the eyeball around the iris. All other primate species have black or deeply pigmented sclerae. Humans also have very small irises compared to other animals- dogs also have white sclera, but they are usually not visible because of how wide their irises are. This makes the human eye very distinct within the animal kingdom. The cooperative eye hypothesis holds that the unique look of the human eye evolved as a means of nonverbal communication: that is, because of our small irises and white sclerae, it is very easy to tell where we are looking at any given moment. This is obviously useful in situations where one needs to be still in silent, like hunting, or escaping from predators. Now several scientists have suggested that this may also have evolved as a means to communicate effectively with dogs. Studies have shown that dogs follow both human gestures and human gazes far better than chimpanzees or wolves do, even young puppies. The propensity of dogs to look into our eyes is different from other animals, even domestic ones. The appearance of the white sclera is very important within Darkeye- it’s one of the first things Mhumhi notices when he first sees a hulker (human) in chapter four. Its eyes were huge and bulging and the white was showing all around them. It was a face of madness. This is significantly different from any eye Mhumhi has seen up to this point, and is frightening because seeing the whites of another dog’s eyes might indicate fear or heightened emotion. Eye color plays a somewhat symbolic factor within Darkeye beyond that, but the sclerae come back into focus when Mhumhi first meets the screamers, humans that have been genetically modified to lose intelligence, in chapter 59. He had not really seen it before in the dim light, but now the hulker was closer to him, closer to the light spilling in from the doorway. There was something bizarre about this hulker’s eyes. They had black pupils and a ring of brown iris- but the sclera around them that should have been white was as black as the pupil. For the most part I did not intend the screamers to behave in a more “ape-like” manner than the average human (though their infants do cling with both their hands and feet like apes do), but their eyes resemble the eyes of the great apes more than hominids. The screamers were definitely intended to be more domesticated humans, specifically in terms of their neotenic behavior: they are more playful, less reactive, and far more affectionate than normal. You could say that they have an inherent desire to please. Why are humans fascinated with the idea of talking animals- specifically talking dogs? I’d like to compile a full list of media where the dogs can talk to humans, because seriously, there is a lot out there. By the way, that Japanese bark translator really does exist, and is known in America as the BowLingual. It’s not even the only dog translator out there. A Scandinavian group is currently developing a device called No More Woof that would theoretically be able to translate a dog’s brainwaves into accurate emotional statements. It’s all a bit puzzling, as most dogs are actually quite good at communicating their needs without the use of any language at all in my experience. Isn’t your dog good about showing when she is hungry, when she wants to play, and when she is frightened? Many dogs even devise ways communicate things like when they need to go to the bathroom. Beyond that, there probably aren’t many more complicated things that your dogs wants to or could tell you. It’s an interesting philosophical subject, and probably another one that I’ll try to revisit in the future. Science fiction is speculative by nature, particularly dystopian science fiction, which is an exercise in things that go wrong with human society. At this point, it’s pretty hard to find an idea that hasn’t been done before, and voluntary human extinction is one of them. However, when I nailed it down as part of the premise for Darkeye, I had no idea that there was a real live group of people advocating for the same thing. They’re known as the Voluntary Human Extinction Movement, or VHEMT. Like the humans in Darkeye, they believe that humans are using up the resources and ruining the planet, and everything would be better off if we just went extinct. While they advocate for an end to human reproduction rather than mass suicide as in Darkeye, it was still a little eerie when I first read about them a week or so ago. I suppose I shouldn’t have been as surprised that such a real group really exists, however. It’s rarely directly referred to, but anthropogenic ecocide is the cause of most of the trouble in Darkeye. Of course, we are only viewing the status of one city, and we know that it was a city specifically cut off from other resources to reduce the population. I guess the question is, did that solution work? What is the status of the outside world? Is this a question I’ll ever answer? What do you think? Evolutionarily, everyone is primed to care for their own offspring. Any gene would prompt us to do otherwise was probably quickly outcompeted- because when caring for someone else’s offspring, we’re taking resources away from our own. Of course, it is definitely not unheard of in nature for members of highly social species to care for the offspring of others. Most commonly, it is the offspring of family members that they are closely related to; that way there is still a genetic benefit to be gained. 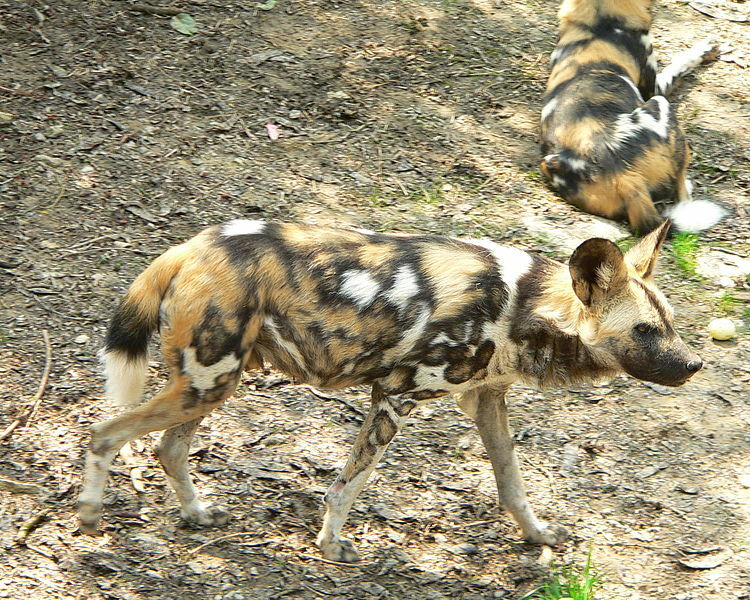 However, occasionally, in species like African wild dogs, individuals will raise offspring that they are not related to. This is likely due to what I mentioned earlier, about how this species cannot survive in groups that are too small. They may need those puppies, related or not. Adoption without need, however, is even rarer. But it does happen in the wild. From a leopard caring for a baby baboon to a lion guarding baby oryxes and even to capuchin monkeys treating a baby marmoset like one of their own, you can find accounts of this bizarre behavior if you search hard enough. It sort of puts the cold-minded genetic view in a different, more emotional perspective when we look at these cases. The instinct to nurture has definitely evolved for a specific reason, but it is still that: a need to care for things. Most of these cases occur just after the animal has lost offspring or family members of its own. One of my favorite trans-species adoption cases takes place between an African wild dog and two litters of jackal pups. I actually did not know about this case when I began writing Darkeye. The wild dog, called Solo, lost her entire pack, and was the only wild dog present for several miles. Human observers later found her with a litter of jackal pups following her. Solo fed the pups, who would then go back to their natural parents. Solo adopted at least one more litter (that was as of 2013, I haven’t heard much more since then). She initially drove away the parents to get access to the pups in the den, but eventually allowed them to come back. This behavior is more remarkable when you consider that the wild dog-jackal relationship is normally more akin to the relationship between wolves and coyotes in America: that is, the wild dogs will chase and kill jackals they think are competing with them. Even more fascinating is the fact that Solo also apparently had a sort of relationship with the local hyena clan, and was observed feeding and interacting peacefully with them. Again, this is almost unheard of. Hyenas are a huge problem for wild dogs and engage in high levels of kleptoparasitism on wild dog kills. They also often find and kill their pups. Oddly enough, though, Solo’s case is not the only one where wild dogs have approached hyenas in a friendly way. I can think of some more. It just goes to show you that aggressive encounters within nature are not necessarily based on hardwired interspecies hatred. When there’s nothing to fight over, nobody fights. Similarly, when there is a need for companionship, animals seek out companions. I’ve only really scratched the surface of a lot of this information, and I haven’t gone into many of the more hard sci-fi aspects that take place in Darkeye, such as retroviral gene therapy. (Admittedly, there is a good deal of scientific handwaving within the story itself.) I may make a part two, with a thorough “Darkeye bibliography,” if anyone is interested. But I hope that this article was at least an interesting read and got you thinking about many of the real-life things that inspired or weirdly parallel Darkeye. All photos used in compliance with their creative commons licenses. To learn more about canines, check out my introduction to canidae; to understand why small dogs live longer than big dogs, click here. To learn more about trans-species adoption, check out my post on animals with pets. And to learn more about one misleadingly-named member of the hyena family, I’ve done a post on the aardwolf! You can also head over to the Darkeye Archive to catch up on the adventures of our candid canines.